I created this bundle to help my students understand analysis and how to apply their newfound skills to write an effective essay. – An exercise using the “Ant and the Grasshopper” fable to help students analyze elements of plot, characterization, symbolism, theme, and setting. – An answer key (with a possible outline) to help student compare their outline with this one. The bundle includes 13 pages and two to three days worth of lessons. 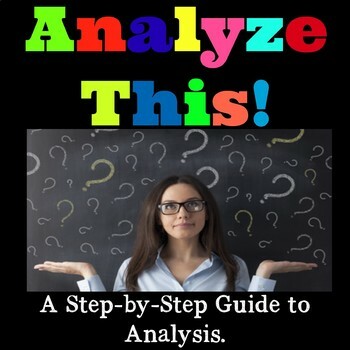 This is a practical and simple way to guide students through the analytical process. I will be adding to this resource. Click on the Follow Me section at the top of my store page and you will be notified when I have revised this product or when a product is on sale. Of course, downloading the revised version will be free.